Dwarf orange trees (Citrus x citrofortunella mitis) are desirable for their compact growth habit, evergreen leaves, fragrant flowers and fruit. Native to China, this tree is often grown strictly as an ornamental, although the oranges are edible. 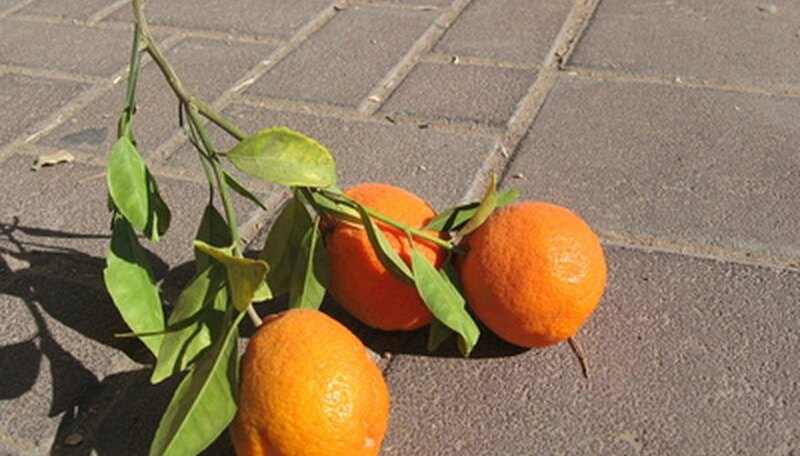 Dwarf orange trees, which are often called Calamondin orange trees, are commonly grown in containers, where they are cultivated indoors or outdoors on patios, decks and terraces. Choose a large enough container for your dwarf orange tree. A container with a 15-inch diameter works well, according to information published by the University of Florida. Make sure the container has drainage holes in the bottom. Commercial potting soil is fine for dwarf orange trees, or make your own planting medium by combining equal parts sterile, fine sand, peat and pine bark. Plant the tree so that the root ball sits about 4 inches below the top of the pot, and water thoroughly. Place your dwarf orange tree where it will receive full sunlight, which is defined as at least six hours of sunlight per day. These trees thrive when given plenty of bright light, according to information published by Texas A&M University. Water only when the plant needs it. Test the surface of the soil. If it feels dry to the touch down to 1 inch below the surface, water the tree. Do not over-water, as this can lead to the development of a fungal disease that will destroy the roots of the dwarf orange. If your container has a water-catch tray, empty it immediately after the plant stops draining to prevent the container from sitting in water. Oranges are acid-loving plants. They benefit greatly from the application of an acidic fertilizer, according to information published by Texas A&M University. Fertilize monthly with an acidic, balanced (20-20-20) water-soluble fertilizer during the growing season (spring through summer). In the fall and winter, reduce the frequency of fertilization to once every five weeks or so, at half the summer dose. Follow the directions on the label for application as per the size of your dwarf orange tree. Dust on the leaves of your dwarf orange tree will attract spider mites and other common insect pests. Give your tree a good rinsing when you see dust and other debris accumulating on the tree's foliage.